It’s not every day you get to work with a bone fide music legend but that’s exactly what’s been happening here of late. 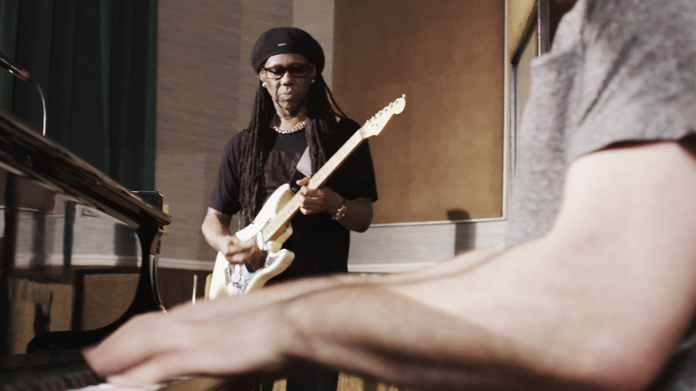 We’ve been helping GoThinkBig – a work placement initiative set up by O2 and Bauer Media – and Nile Rodgers recruit talented 16-24 year-olds to remix, play live and then re-release Chic’s classic disco hit “Le Freak”. No mean feat, let us tell you. We launched the campaign little under a month ago, generating over 3,000 applications from young people keen to join Nile and his co-collaborators Rudimental in the studio and as part of the crew putting on the live show at Indigo at The O2. We lined up a day of back-to-back media interviews with Nile, landing a host of national and music media, including an appearance by Nile on the coveted sofa of ITV breakfast show, Lorraine. Then the whole crew settled into the iconic RAK studios in St John’s Wood for two days to lay down a new version of “Le Freak”. We made sure the whole process played out in the media, with Kiss FM, BBC Radio 1, the Daily Star and the Evening Standard documenting the sessions with interviews, a stunning double page and a page-lead news story, respectively. The show swiftly sold out receiving rave reviews, with the Metro giving it a top score of five stars and Daily Star a stand-out write-up. To date, the project has chalked up nearly 100 pieces of coverage, including the Daily Mirror, NME, London Live, Flux, BBC 6 Music, Q magazine (more than once), Shortlist, the Independent, Mixmag, Digital Spy and Drowned in Sound. The team also landed over 20 radio slots across regional BBC stations up and down the country. And in case you’re wondering what the track sounds like, well, it sounds like this. The music video, produced by Rankin, is here for all to see (and below! ).